You are now required to warn your client's customer if any dish on your menu contains one or more of the fourteen major food allergens covered by the legislation. The maximum fine in the case of a successful prosecution for non-compliance with the legislation is currently £5000 per dish. However, a far more serious consequence of non-compliance is the very real risk that your client's customer may suffer serious harm if they are served a dish containing ingredients to which they may be allergic. Recently, there has been the highly-publicised case of a 18-year-old student who died as a result of eating a chicken dish in a Manchester restaurant that she should never have been served. Over the past few months, it is not an overstatement to say that I have been inundated with questions from my clients and other catering professionals about the new legislation and how it will affect their businesses. Many of the business that contacted me were completely unaware that the legislation had come into force. Even those that did know about it were not clear about exactly what it involved. 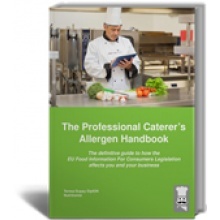 Therefore, I have written The Professional Caterer's Allergen Handbook to provide you with the complete lowdown on what the Food Information For Consumers legislation really means to you and your business. Even if you are up-to-speed with the legislation, I am sure that you will still find this book useful because it is often the case that you don't know what you don’t know. If you would like a free copy of the Professional Caterer's Allergen Handbook, drop me an email or give me a ring and I'll get one out to you. You'll find our contact details on the home page.